This month's Daring Baker's challenge was something I had never heard of before, much less ever made. When I read the challenge the first time, I was so intimidated by its sheer size (it was 10 pages long printed out) I ignored it for two weeks! I almost wimped out and was going to skip this challenge entirely. I'm SO glad I didn't! Although traditionally Opera cake is made with a mocha filling and dark chocolate ganache, our mission was to produce a cake with only light colors and flavors. I loved this idea as chocolate is not one of my favorites (sacrilege, I know). But what flavor should I choose? I choose lavender. I was a little apprehensive at first because I wasn't sure if it would really appeal to anyone but me, but I forged ahead. About a month or so ago, I purchased a bottle of lavender extract on a whim and this was as perfect time as ever to use it. I think it was kismet, honestly. Believe me when I say it was meant for this cake. It was pure bliss! 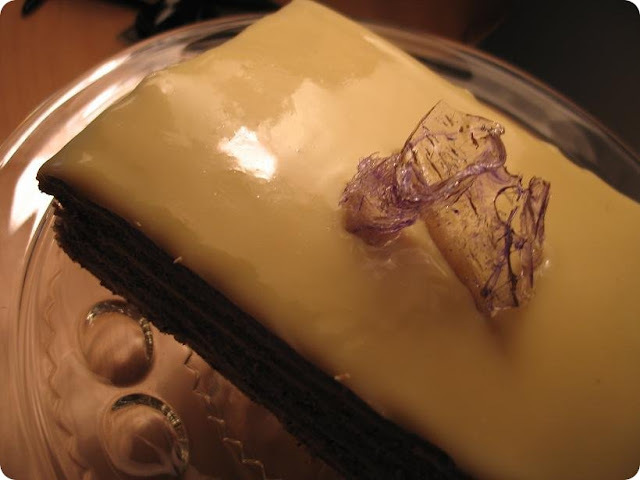 The cake had 5 parts - the bottom layer (joconde), a syrup (to wet the joconde), a butter cream (the lighter, yellowish filling), a mousse (the light purple layer), and the glaze on top. I made the cake exactly as the recipe said to, but added only 1/2 teaspoon of lavender extract to the syrup. I actually made two batches, using a full one tablespoon of extract as per the recipe's direction but it was way, way too much. I made the butter cream exactly as the recipe stated too, using a real vanilla bean to flavor it. For fun and because purple is my favorite color, I added another half a teaspoon of lavender extract and a few toothpick blobs-fuls of purple food coloring paste to the to the mousse. The glaze was just Guittard white chocolate that I bought in bulk and cream. And for just a little something extra, I boiled a little sugar, added some dried lavender, a little extract, and some more purple blobs, and created some pretty sugar candy for the top. The only problem that I had with this challenge, aside from deciding on a flavor, was that my cake was short. I decided to make half the recipe and used my big 18x13 jelly roll pan because that was all I had. This created a very short joconde layer which affected the height of the cake overall. To remedy this, I just stacked one cake on top of the other and then finished the cake with the glaze and candy garnish. Considering the challenges I've had with other Daring Baker Challenges, a short cake is no biggie, right? great use of lavender. 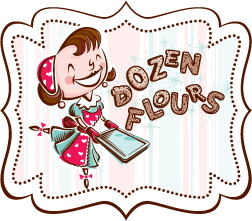 I love cooking with flowers. Your cake is beautiful! I love how shiny you got the glaze to be. Great job on the challenge! I have never cooked with lavendar myself but it sounds lovely! Yummy. I would have shrunk back from a "10" page long recipe. But the cake looks fab! 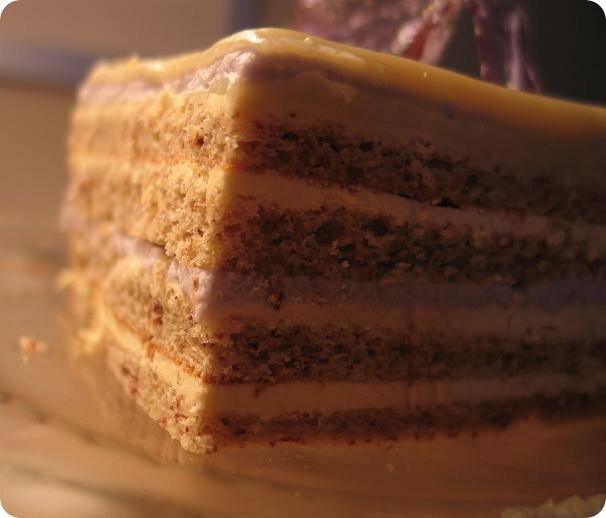 All the layers make it look so elegant....never herar of lavender extract, will have to look into it. Does it taste good? 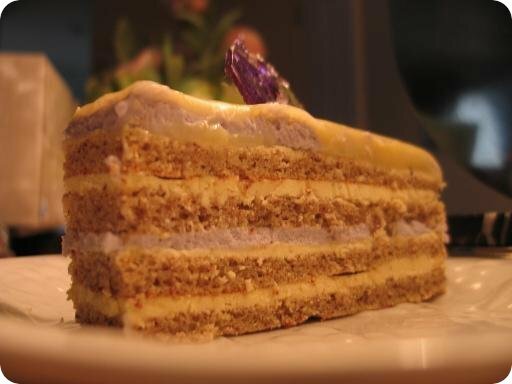 Although I'm not a huge lavender fan, I am a huge fan of yours after seeing what a great job you did on your opera cake! Beautiful cake! I adore the lavender brittle on top. I have always wanted to cook with lavender so I must give it a go. Looks tasty! Can I have a bite, please? Great Job! I love the little garnish! I love your lavender idea! Your cake looks so pretty & I bet it was a pure slice of haven to taste. 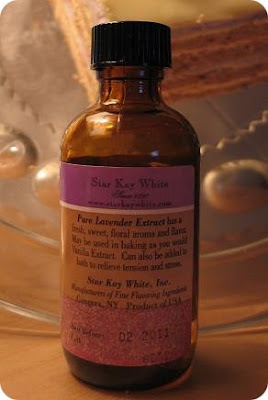 I've never seen lavender extract but it sounds like a fun flavor. Your cake looks like a 5 out of 5! Lavender is something I've wanted to try working with. Your cake is beautiful - I think it's gorgeous! wow, it's beautiful. i love the decoration on top of the cake, and lavender sounds lovely... i like to use it, too :) it feels so summery! 10 pages! scaaarry!! I'm going to have to look for lavender extract. Sounds delicious! A beauty of a cake. That was indeed one long recipe but oh so worth it. This. Looks. Amazing. Finally stopping by your blog after a long weekend...really wonderful stuff! So good to meet you at Velocity last week! Great job...the colors are beautiful!